Cheryl Klein, Senior Editor at Arthur A. Levine Books, hopped on a train from NYC to Andover, MA to give an informative talk recently to our children’s book writers’ critique group. She fielded questions we had previously submitted. She also read and gave feedback on first pages from some member’s works. Her penetrating insights on first hearing these one-page samples were amazing. It was as though she could anticipate the thrust of the entire story from just that 250 word sample. Marilyn Salerno, the New England Regional Coordinator of SCBW&I, also attended, and served as Cheryl’s reader. 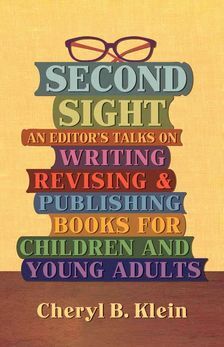 Cheryl is also the author of Second Sight: An Editor’s Talks on Writing, Revising, and Publishing Books for Children and Young Adults which is now available for purchase. It is a collection of self-published essays from a young editor who has selected and shaped many books that have depth of character and living, breathing plots. She talked to us about her company’s publishing 90% novels and 10% picturebooks, mainly submitted through agents. She read examples of good submissions and talked about cover letters. Her editorial process includes a preference for outlining a fiction story to see the plot arc, and how many “beats” in a scene. She would like to see more stories from authors whose first nationality was not American. She suggested that writers not put all their eggs in one basket in terms of genre and not to write to trends because things shift. She suggested that you have to love your characters enough to live with them for two years or more, also don’t fall prey to “conceptitis”, where you give away the game too soon or in other ways become distracted by the theme at the expense of getting the reader hooked into the character. She talked about genre characteristics, for example, that most YAs are written in the first person with present tense being the strongest, whereas middle grade fiction often works better in past tense. A grant from the SCBW&I (Society of Children’s Book Writers and Illustrators) funded her visit. This organization, which I have belonged to for decades, is a must for anyone interested in writing or illustrating children’s books. Having access to someone of Cheryl Klein’s stature is only one example of the benefits of membership.